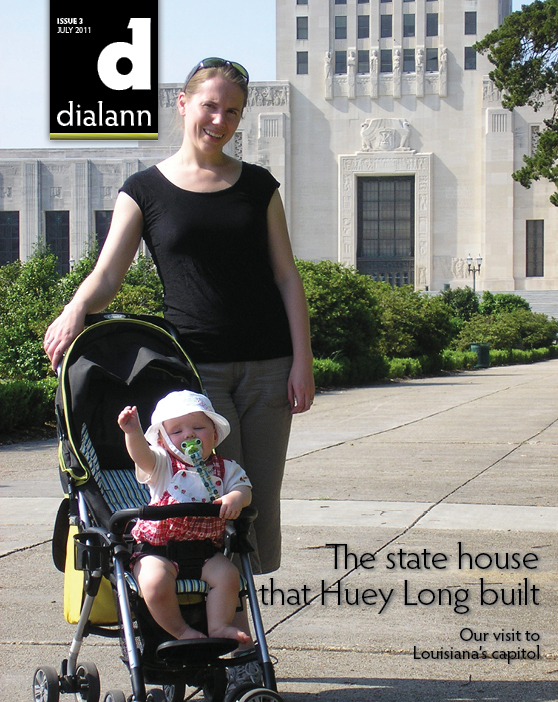 On Tuesday, 19 April 2011, during our spring-break trip to the Deep South, we took a daytrip from New Orleans to Baton Rouge, Louisiana’s capital. The primary purpose of this excursion, of course, was to see the state capitol—the 28th in my quest to visit all 50. That evening, after our visit to the capitol, Susan and I also attended the Baton Rouge Louisiana Temple. The skyscraper form of the Louisiana capitol is a unique feature shared by only two other state houses, those of Nebraska and North Dakota. (Nebraska’s capitol was, in fact, the inspiration for Louisiana’s.) The building was conceived in 1928—the height of the Roaring Twenties just before the start of the Great Depression—during the successful gubernatorial campaign of Huey Long. The illustrious Mr. Long was one of America’s most colorful political figures. He wanted a beautiful, modern building that spoke of what Louisiana was and aspired to be—a modern, powerful, prosperous state. It’s probably also fair to say that he wanted a permanent public work that matched his own ego. Ironically, Mr. Long never occupied the governor’s office in the capitol whose construction he championed. He was elected to the United States Senate in 1931, shortly before the dedication of the capitol on 16 May 1932. In a strange twist of fate, Mr. Long was assassinated in the corridor outside the governor’s office on 10 September 1935. In the end, however, I think Mr. Long got in this building what he wanted. The Louisiana State Capitol is one of the best examples of 1920s art deco in the world, and among all the state capitols I’ve been to, it certainly ranks among the most beautiful. Fiona on the observation deck. It was really windy when we were up there. Fiona loved it. View of the capitol grounds and downtown Baton Rouge from the observation deck. Notice the Mississippi River in the upper right. The capitol grounds and downtown Baton Rouge seen from the front steps of the capitol. Forty-nine steps lead to the capitol’s entrance. The names of the states are inscribed on the steps in the order in which they joined the Union. The top step is inscribed with E pluribus unum, flanked by Alaska and Hawai‘i, which were admitted to the Union in 1959, more than two decades after the capitol was completed. The flags that hang from the balcony above the elevators include those of the various nations that have ruled Louisiana throughout its history: Castile and Leon; France, with both the flag of Bourbon France and the modern French tricolor; Bourbon Spain; the United Kingdom; the Republic of West Florida; the Louisiana national flag; the third national flag of the Confederate States of America; Louisiana’s modern state flag; and the United States of America, with both a 15-star flag and the modern flag. The entrance hall to the capitol from a balcony overlooking the lobby. Huey Long, who was governor of Louisiana from 1928 to 1932 and championed the construction of the capitol, is buried in the center of the grounds in front of the building. This monument marks his grave.